Most “best-of” lists for buildings focus on superlatives: tallest, prettiest, most expensive. For the past 50 days, The Guardian has taken a slightly different approach by compiling a stellar lineup of 50 great buildings in 50 different cities. The series serves as both a crash course in architectural history and comprehensive survey of where contemporary urbanism is headed. The list manages to include many popular favorites, like the Sagrada Familia in Barcelona and the Guggenheim in Bilbao, as well as many projects we’ve covered here on Gizmodo like the Makoko Floating School in Lagos, Nigeria and Houston’s ill-fated Astrodome. But what makes this list so wonderful, however, is that it’s not just the stereotypical greatest hits from every city. There are also inspired choices which manage to cover larger issues around public space, population booms, and engineering technology. A collapsed department store in Seoul. The first Starbucks in Seattle. Beijing’s original stock exchange. I also enjoyed the way transportation is well-represented, which may change our cities more than any single building: It’s Curitiba’s bus rapid transit system that gets the nod, as well as LA’s innovative stacked freeway interchange. And I discovered many places I’d never heard of before, like a striking modern gas station built by Italian invaders in the East African city of Asmara, Eritrea. The series ends today with a grand finale: the Kingdom Tower in Jeddah, Saudi Arabia, which will be the tallest building on the planet when it’s finished in 2018. 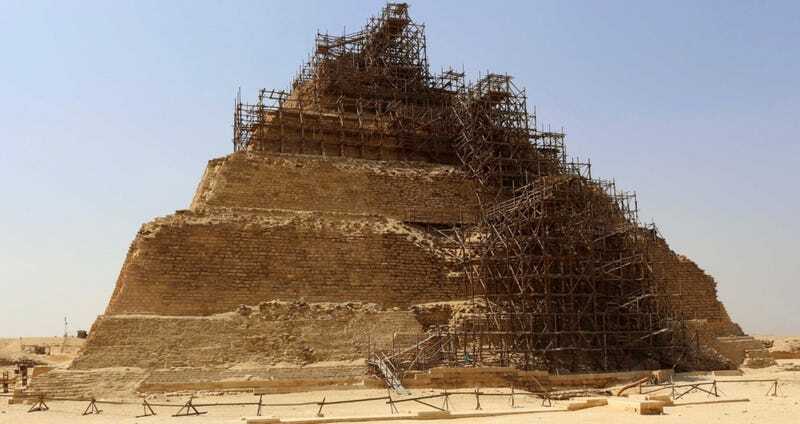 It’s a fitting bookend to building #1: The 4,600-year-old pyramid of Zoser (top image) in Memphis, Egypt. As the essay notes, the Giza pyramids are larger and more famous, but this 200-foot tall structure—“the Burj Khalifa of its day”—was built nearly two millennia earlier. It was a civilization’s first attempt at leaving a mark on the planet that would outlast everyone who built it—and it’s still standing. As the series proves, humanity hasn’t looked back since.